There's a famous urban legend that involves Ernest Hemingway, a short story, a bar, and a bet. So it goes, Hemingway bragged to a table of friends that he could write a complete story in just six words. It'd have a beginning, a middle, and an end. All wrapped up before his word count hit double digits. They balked, the lot of them gathered around that table. Hemingway said 10 bucks each. If he could do it, he'd win the pot. If he couldn't, he'd pay up. Out flew the Hamiltons. And presumably a few skeptical chuckles, too. And then out poured the words, not five, not seven, but six, etched on a bar napkin: "For sale: Baby shoes, never worn." A beginning, a middle, an end. A complete story. Unfurling heartbreaking flash fiction before his friends, Hemingway, winning the bet, added to his legacy that he was the king supreme of squeezing the most into the least, packing punch without flailing, crunching an entire story arc into six words (still less than 10 syllables!) without a shred of excess. In a stroke of literary genius, Hemingway showed that you only need a little to get a lot when you have a story and focus intensely on the significance of each word. The story – although largely unsubstantiated and widely debated – makes for a great discussion point amongst budding English majors and a great conversation starter amongst libating literature lovers. Whether or not it's true in the sense that it actually happened, a truth it teaches – the importance of the distillation of a narrative, the squeezing of substance until the purest essence emerges – is as important as it was the first time the tale was told. In short, a lot can be said with a little. And much energy should be expended on deciding exactly what to how and how to say it. The same can be said for politics. More on that later. This story marks the fourth in a series the Reader has published in the lead-up to May 16's mayoral primary election when Erie will elect a candidate to represent the Democratic Party and a candidate to represent the Republican Party. We've dedicated this space to this race because many have argued that this may be the most important election Erie has ever faced. For many reasons, it is. Erie is still grappling with a steady population decline that began during the Tullio administration. The city's public schools are facing their greatest challenge to date. The opioid epidemic has found its way to Erie, and drug-related deaths are outpacing those caused by violent crime – which is still a major concern. Erie's on the national radar, for the good, the bad, and the ugly. Some national correspondents claim that if you want to move to where history is being made, move to Erie. Others are calling Erie a "fading factory town." Regardless of the reason, Erie's in the spotlight. And the opening music has begun. Fiber Internet expansion is being provided not by Google but by Velocity Network, a local company that's chosen to relocate in the city. Erie Insurance – a Fortune 500 company anchoring downtown development – is continuing to expand. The making of an innovation district is being planned. The reality of a community college (note: Erie is the largest metropolitan region not served by a community college) seems more likely now than ever (and that's a 30-plus-year discussion!). Our universities are expanding and growing. So are our hospitals. Our Bayfront remains largely a blank canvas waiting to be adorned. The city has a comprehensive plan. There's a downtown masterplan. Individual neighborhoods are planning, too. So the list goes. And this will all be laid at the feet of Erie's next mayor. Which is why this election matters. The Reader's coverage began back on Feb. 15 when "What History Will Erie Elect to Make?" graced the cover. The feature focused on what New York Times columnist David Brooks dubs "The Fallows Question." Based on the work James and Deborah Fallows have done in their most recent project for The Atlantic – "City Makers: American Futures," a series Erie was part of – Brooks asks: If you had to move where history is being made, where would you move? Earlier this year, he asked the Fallows themselves. Amongst their responses: Erie, Pennsylvania. What's significant to note is that while Erie is currently making history for a host of reasons, the narrative is about to get a new storyteller in its chief executive office at City Hall. A new mayor can mean an adherence to the storyline as being told, advance the plotline more aggressively, pivot course, put down the pencil, or pick up an eraser. The coverage continued a little less than a month later with a call for voters to head to the buffet of forums and debates to see how the candidates stacked up against each other. While some candidates stood out more than others, they all largely settled for a polite decorum and stuck to their scripts without much sparring. And no candidate stalked another around the stage, there were no nasal issues, and no one called anyone else a liar. Our most recent coverage featured the candidates in their own words, at length, speaking on innovation, business, and the future of Erie. While truncated responses appeared in the print edition, fully fleshed out answers were run online. In fact, they're still there. Along with all of the other coverage. But noting how and why we got here is still important. And here must be noted in two ways: The short and the long paths. Term limits draw the lines along the long path – first by their absence, second by their presence. Prior to the close of the 20th century, Erie mayors were not limited in the number of terms they could seek. Such freedom afforded Lou Tullio – first elected in 1965 – to continue to hold office until his death in 1989. Although he had decided not to seek a seventh term, Tullio served as mayor through three decades. He was the last to be unencumbered by limits. As Joyce Savocchio entered office in 1990, she knew that at best, her total time in the mayor's office would only be half of Tullio's. Savocchio, Erie's first woman to be elected mayor, would serve as the first mayor under the newly-imposed term limits, limiting candidates to three four-year terms. Savocchio went on to win both of her re-election bids and left office inevitably not because of the ballot but because of the limit. Her successor, Rick Filippi, would not experience the same fate. Battling state prosecutor allegations of using his position to broker real estate deals near the then-proposed $80 million lake front gambling enterprise that arose prior to 2005's primary election, Filippi served just one term in office from 2002 to 2006. Although Filippi was acquitted of all charges facing him, publicity the case drew may have factored in when voters pulled the lever, marking his tenure as the only one since the imposed term limits cut short by ballot and not by limit. Joe Sinnott bested Filippi and his challengers in the 2005 primary, and since then, he's remained at City Hall, slated to depart in January 2018. For both of his re-election bids, Sinnott faced zero opposition. So now, whether they want it or not, Erieites must undergo a change in leadership. With that change comes two important notes: Erie's long, blue line, and Erie voters' penchant to vote for reactionary successors. While it's only been four mayors since Tullio took office, it's been more than 50 years of straight Democratic leadership from the mayoral post. Erie's last Republican mayor, Charles Williamson, took office in 1961, and since then it's been a long, blue line, as the city's shifted to a more than two-to-one Democratic voter-registration edge, making the path to victory for a Republican in the general election a more difficult one. Even the recent presidential election, which saw many Democratic voter strongholds turn red, didn't sway the city. An overwhelming majority of city residents voted for Hillary Clinton, despite the county tipping toward Donald Trump. But Erie voters – when a new mayor is about to take office – use the occasion to push the political pendulum away from where it's been. Savocchio – who addressed Erie's critically crumbling infrastructure – came as an answer to Tullio, who'd left it largely unaddressed. With money banked in reserve from Savocchio, in came Filippi to spend it. And then with bankruptcy a la Act 47 knocking on the door, Sinnott crossed the 626 State Street threshold to balance the budget. If time follows the course of history, voters will react in the booth to Sinnott. Although still too early to judge, the historical success of the Sinnott administration will be that of converting an $11.7 million deficit into a $5 million surplus. Criticism, as he leaves office, is that that's where he's spent too much of his time; rather than in public, on the street, attending numerous meetings like his predecessors did, Mayor Sinnott remained less in the public eye. And it's not to say that he did not do what he thought would be in Erie's best interest or was absent on the job. Fair or not, perceptions, for many, become reality. And the reality today is: Voters want a mayor whom they perceive as active. At the onset of Erie's current mayoral primary election, there were plenty more names rumored. That there are more folks running than voting is a joke that could've worked at Jr.'s Last Laugh for several months and not gotten old, and placing proverbial bets on who might run might've gotten more ticket play than the races at Presque Isle Downs. Even local cartoonist Bryan Toy ran a panel in which Godzilla was considering running. But then the listening tours began. 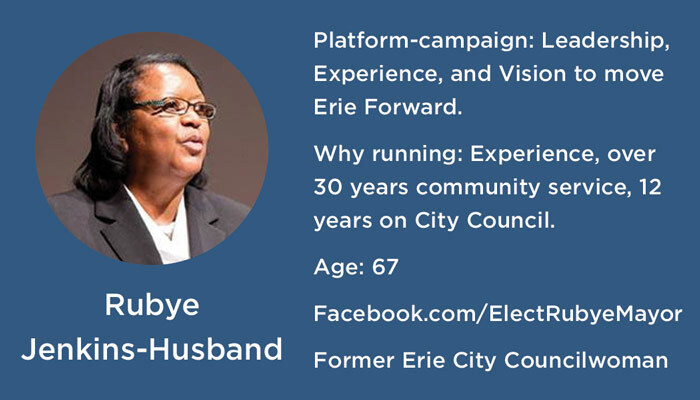 Websites and Facebook pages started lighting up, and before long, candidates declared publicly that they would seek to serve Erie as its next mayor. The announcement timeline runs from Nov. 2, 2016 to Feb. 2, 2017. It is bookended by the two youngest candidates in this election to declare their bids to become Erie's next mayor. And then on Feb. 2, 2017, John Persinger, 35, confirmed he intended to be included on the dance card. For more than a month, Erie voters would spend their time discussing those 10 names – until it shrunk to nine. On March 6, 2017, just one day prior to the filing deadline for nomination petitions, Zimmer, the elder amongst the candidates, ended his campaign. He cited personal reasons, telling Erie Times-News' Kevin Flowers: "It's not a matter of life or death, but there are things I have to see to." As of March 7, all of the remaining nine obtained the necessary 100 signatures and filed their paperwork. Kind of. First, in March, the signatures obtained by Whaley were challenged. He obtained 105 and the attorney for a citizen challenging Whaley's signatures convinced Judge John Garhart to toss six invalid signatures, leaving him with 99. But to Whaley's credit for knowing specifics of nomination petition challenges, he cited that a citizen must file a copy of the complaint with the county election office – which wasn't done. When Whaley brought that to the attention of Judge Garhart, the challenge was scrapped and Whaley remained on the ballot. Then in April, the ballot could've been reduced to two. Seven of the nine candidates failed the Pennsylvania Ethics Commission requirement to file a statement of financial interests not only at the County Courthouse's Voter Registration office but also with City Clerk Rose Boyer's City Hall office. Only Jenkins-Husband and Merski complied, but because no one challenged what otherwise would've been a fatal error for five Democrats and both Republicans, the dance card remained unaffected. So at the time this feature was submitted, nine of the original 10 remain in the race and are seeking election on Tuesday, May 16. Breneman is the youngest candidate (if only by a year) at 34 (to Persinger's 35). Jenkins-Husband is the oldest candidate (if only by a year) at 67 (to Schember's 66). When Tullio took office, he was 50; Savocchio, 47; Filippi (Erie's youngest mayor), 35; and Sinnott, 40. The average age of the last four mayors: 43. Persinger's report was not available. And as for sheer odds of winning based on number of challengers: Of the seven Democrats, each has slightly more than a 14 percent chance of winning; of the Republicans, each has a 50 percent chance. And now, we return to the beginning. A week from when the issue of the Erie Reader featuring this story hits stands, the pool of candidates vying to become Erie's next mayor will have been whittled from nine to two: One Democrat, one Republican. Tuesday, May 16 marks Erie's primary election, and with polls closing at 8 p.m. and precincts closest to the Erie County Courthouse (where votes are tallied) coming in first, it's safe to assume that barring extraordinary situations, a pair of candidates will be giving their victory speeches before the 11 o'clock news. In the feature prior to this one, we highlighted the candidates' responses to five questions in print and an additional three online. They were lengthy, thoughtful, and in the candidates' own words. This time around – because most've heard the speeches, seen the commercials, and have a general sense of who's who and who stands for what and why – I asked each candidate to describe their platform and campaign in six words. I also asked them, in six additional words, to tell me (the writer) why they're running so that you (the reader) could get a sense of them at their most distilled essence. I didn't tell them about the Hemingway story. But I did tell them that they could opt for a couple of sentences. Or not. And I did tell them that they'd be printed verbatim as they were received. In fairness to the candidates, their responses are in the order in which they will appear on the May 16 ballot. Some pushed the boundaries and used more than six words. Some used less. Maybe that's daring and bold. Maybe they weren't counting articles or conjunctions. Maybe it's an indication that they're rule benders or breakers. Can an ampersand be counted as punctuation? Or maybe they're folks who don't like following directions. But of all of the words in all of the world, these were the six-ish each candidate chose. I have my notes on what stands out to me, but dear readers and voters, you get to be the judge on who gets the proverbial Hamiltons. 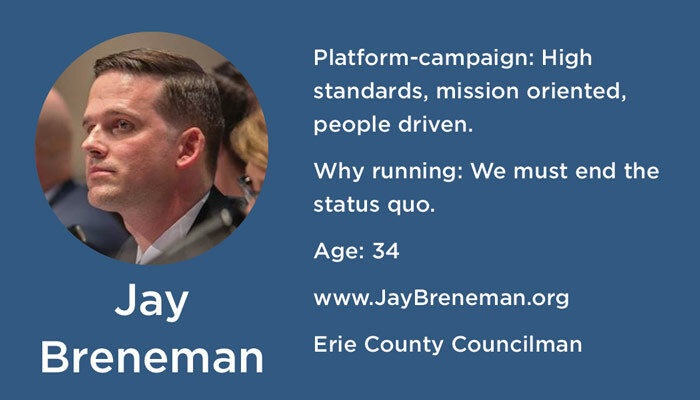 Of note: Breneman and Persinger – a Democrat and a Republican, both the youngest vying to represent their respective parties – are running to "end the status quo," answering that part nearly identically. 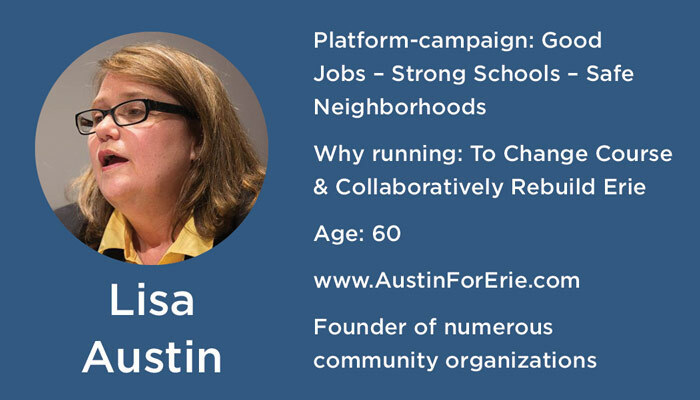 Similarly, Austin is running to "change course" while "collaboratively" – a word Clerkin uses in her reason for running – rebuilding Erie. Jenkins-Husband went heavy on "experience," using it both in her platform-campaign answer as well as her reason for running, citing community and governmental experience. 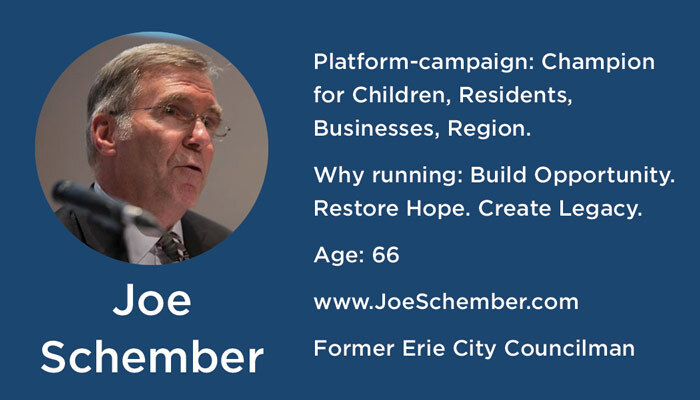 While Schember's platform-campaign answer features "champion" – for his case: children, residents, businesses, and region – Merski is running to "be a champion for Erie." 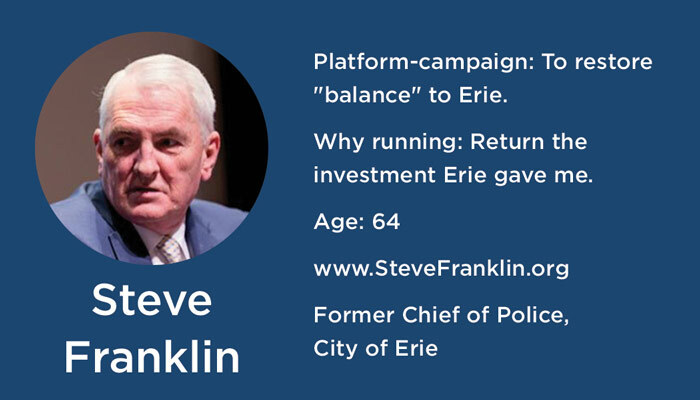 Franklin wants to "restore 'balance' to Erie," while Schember's running to "restore hope." 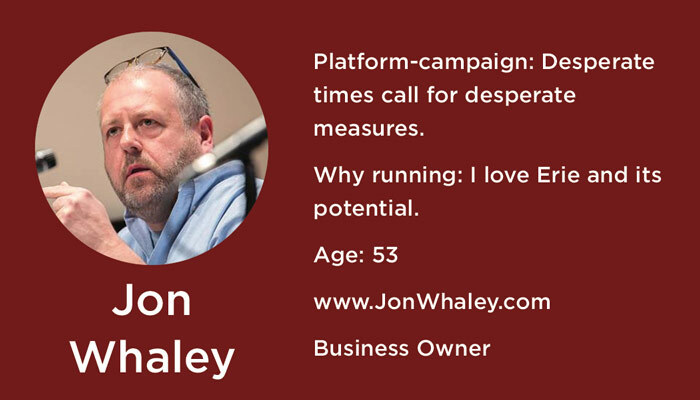 Perhaps in a similar vein, Whaley's platform-campaign is "desperate times call for desperate measures." Seven candidates' responses featured "Erie." Only Breneman and Schember did not. Franklin used it twice, once in each answer. 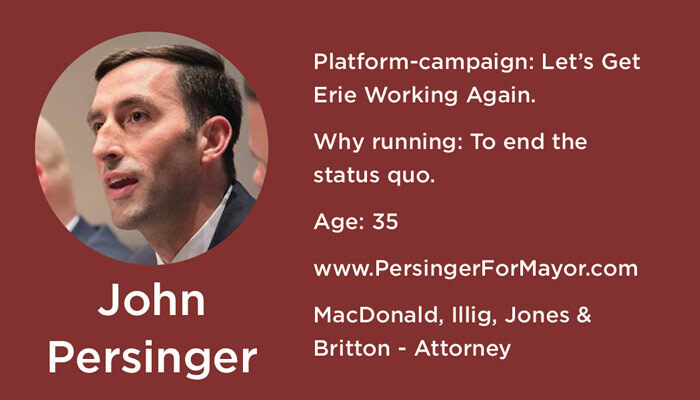 Two featured "jobs" – Austin and Merski – while one – Persinger – wants to "get Erie working again" (which I presume means jobs and not that Erie's broken and needs to be fixed). Alliteration award: Clerkin for "better, brighter, bolder." Positivity award: Whaley for "I love Erie and its potential." Not-so-positivity points: Whaley for "desperate times call for desperate measures." Forums, Polls, Endorsements – oh my. 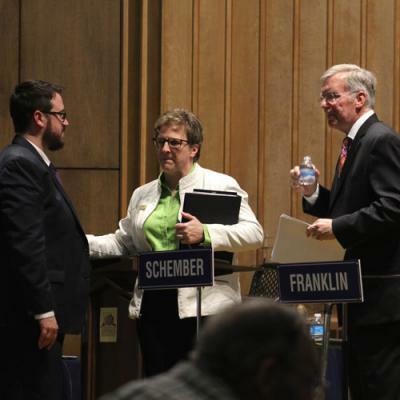 First, Erie clearly favors forums over debates – even if candidates are asked to debate. Perhaps it's because that's what candidates have become accustomed to. Perhaps it's because everyone's so darned polite. Perhaps it's because they fear running the risk of looking negative vis-à-vis attacking another candidate's platform and hope that you, the voter, can distinguish the differences between sound arguments and empty rhetoric. Whatever the case: You, the viewer-turned-voter, bear the burden of paying closer attention. It should be celebrated that various Erie organizations hosted various candidates' gatherings – be they debates, forums, meet-and-greets, or town halls. It's a clear sign that Erie wants to hear from those running for mayor. Those who attended – both candidates and voters – should be celebrated, too, despite several audiences looking sparse. An expectation that constituents will want to continue to hear from candidates-turned-elected-officials exists. Voters should look for video of the debates/forums. And re-watch them. Again. And again. They should re-watch because debates give voters of sense of preparation, poise, and positions when put on the spot. Although developments after the Kennedy-Nixon debate of 1960 suggest that debates should be watched first with the sound off – since debates are now largely about image – I recommend the opposite: Listen to them without the video. Listen for the energy. The passion. The dynamism. The knowledge. The ability to actually answer questions. Listen for the incomplete thoughts, trailing off compared to complete, confident comments. Listen for ability to articulate a depth of knowledge compared to the limited quips and phrases that make for easily repeated stump speeches. Listen for not just the passion but the political awareness. Of critical note, C-SPAN Senior Executive Producer, Political Editor, and Primary Host Steve Scully, who hosted the debate held at the Jefferson Educational Society in partnership with the Erie Reader and WQLN Public Media asked a straightforward question of all of the Democratic candidates. "One of you will represent your party; the others will be voted off of the island. Show of hands: Who will support the Democratic nominee?" Every candidate raised their hand. The first indication of how voters were trending came from the Merski campaign. In late March, the campaign released an internal poll conducted by D.C.-based Greenberg Quinlan Rosner Research with Merski reporting at 37 percent amongst likely Democratic primary voters. Behind him, Schember reported at 15 percent, Jenkins-Husband at 14 percent, and Breneman at 10 percent. The remaining three candidates – Austin, Clerkin, and Franklin – according to the poll, each notched 5 percent. The second indication came in late April from the Breneman camp. According to that internal poll conducted by the campaign, Breneman leads the pack with 29 percent, followed by Merski at 25 percent, and Schember at 20 percent. Clerkin and Jenkins-Husband reported 6 percent, in front of Austin and Franklin at 4 percent. The reports of each poll came from 400 likely voters, and Breneman's poll featured a 3.9 percent plus-or-minus margin of error, while the Merski poll was at 4.9 percent. The Breneman campaign released its methodology; the Merski camp did not. The most recent data yet comes from the Austin campaign, which surveyed 1,000 likely voters with a 3 percent margin of error. Austin's poll revealed that 22 percent responded they would vote for Austin, while 24 would not. Fifty-four percent remained undecided. But when it comes to polls and surveys, if recent history offers any reminder, it's that they aren't perfect. Reminder: Clinton led Trump in the polls leading up to the election, yet lost when those polled became those who voted. Polls aside, history also reminds us that big news in the final days before an election can impact the election results. As Nate Silver at 538 reported after the 2016 presidential election, FBI Director James Comey's letter to Congress issued just before the election had a "measurable impact" on the outcome of the election, noting that Clinton would've most likely won had the letter not been released. Which is to say: Polls are good barometers, but a break or gathering of clouds without warning can come with a strong enough change in the winds. Supporting Acts to the Stage! Undoubtedly, endorsements will affect this election. How they affect it, however, remains largely to be seen because we've yet to see how they're affecting the campaigns and the candidates. Editor's disclaimer: This feature is not an endorsement of any particular candidate. And, as I finish writing this feature on Sunday, May 7, I do not know if the Reader will endorse a candidate. If it does, I have not weighed in on that decision in a fair approach to my coverage here, which is guided by my own research and own opinions of how the research and my thoughts should be presented. What cannot be ignored in the lead-up to the election and the impact it'll have is the endorsement of the Erie Times-News editorial board. On Sunday, May 7, the Times endorsed Joe Schember as "the Democrats' best choice." "John Persinger," the headline read, "merits nod from Erie GOP voters." Neither selection should come as a surprise to Erie voters, as both candidates have garnered wide support. Both have performed well in the debates and forums. Both have demonstrated passion without relying solely on it as a means of driving their campaigns. And both speak often and loudly to the critical juncture at which Erie finds itself. The differences in the Times' endorsements is that one candidate is said to stand out for his temperament and intellect, while the other for his temperament plus experience and character. It needn't be made more obvious, but a certain level of risk is being assumed with the unproven, young Persinger. Perhaps he was the safer choice in a limited field of candidates (after all, the other often says a sledgehammer is needed to fix City Hall). Whereas risk seems to be used to justify the non-endorsement-yet-worthy-of-being-mentioned notes on Breneman and Merski the Times ran. Breneman, 34, is an impressive and promising young leader who strikes us as still in need of some seasoning. However voters choose, we hope he will continue to pursue his obvious passion for public service. 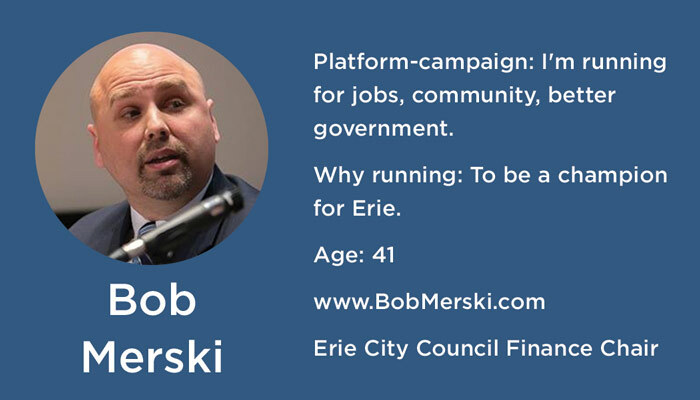 Merski, 41, credibly presented himself as an agent of change, but we're given pause by elements of his record at City Hall. They include the sluggish rollout of Erie Refocused and City Council's intransigence in the Erie Metropolitan Transit Authority dispute, both when Merski served as council president. The Times endorsement carries weight and cannot be ignored. In its history, the Times-Publishing Company had not endorsed a primary candidate until it endorsed Joyce Savocchio the Sunday prior to the primary election of 1989. Some credit Savocchio's victory to the endorsement; others argue she had already built enough momentum and that that was the proverbial icing on the cake. However the cake is sliced, though, Savocchio did come from behind in early polls (she was actually last) to claim a victory in that primary election. What makes the Times endorsement interesting here is that it comes not just a few days but more than a week before the election. The potential greater impact comes in how candidates will react and respond to it. Will it be enough to tempt some to turn their campaign to an attack formation? If so, who's holding onto what cards and when – if at all – will they be played? Is it enough to discourage anyone from finishing the race? Will it inspire individuals to form a coalition and begin lending their resources and support to another candidate? The Times decision to endorse – and endorse early – undoubtedly is making the election cycle more interesting and exciting. Voters will decide the course of the next iteration of Erie in seven days. How many voters deciding that fate remains to be seen. One of the troubling aspects of Erie's election cycles is that the mayoral races fall on "off years." That is, there is not a major election driving up voter turnout at the polls. This is not, however, to say that this election is not major. It is. Perhaps our most important one in decades and for decades to come. Which has been said before, but bears repeating. But without a presidential or gubernatorial race, voter turnout – if trends can be trusted – will be projected to be lower. Erie's record-high turnout was in 1992 when Bill Clinton's presence yielded a nearly 90 percent turnout. Even 2016's presidential election – one in which many voters are now criticized for staying at home – saw a nearly two-thirds turnout. Without a national headliner on the bill, though, anything greater than one-third voter turnout will be heralded as a "good" turnout. Which is to say: One out of three registered voters reading this (maybe fewer) will determine the outcome of Erie's next mayor. The other two, whatever their reasoning, will keep off the field and stick to the sideline. How we got here – the critical challenges Erie faces coupled with the growth gaining momentum – is as important as the why. We are here today because of yesterday. And the course of tomorrow will be determined by today. And while Erie may be quick to criticize the style of soon-to-be-former-mayor Joe Sinnott, it did elect him. And re-elect him. Twice. Both re-elections without opposition. Both through action and inaction, Erie voters determined the fate of the now, the here. If ever a change in Erie exists, it's the hope that we've been good students of history, lest be we doomed to repeat the past, doing the same thing and hoping for different results. Ben Speggen can be reached at bSpeggen@ErieReader.com and you can follow him on Twitter @BenSpeggen. Nick Warren also contributed to this feature and can be contacted at nick@eriereader.com.